I love it because it's like a pot pie, but without the work of the piecrust, and truthfully the crumble topping is so tasty... I just love it better (gasp!) than pot pie! The savory bacon, chicken, rich gravy and colorful mix of veggies... so good! This recipe makes enough for one large 2 qt. casserole. I am an empty nester, just feeding 2 people now, so i divided it up into 2 small dishes. I cooked one for now, and froze one for later. Jan's Tip: If you want to super shortcut this and not make the entire thing from scratch you certainly can.. just use shredded rotisserie chicken, pre-made gravy, and canned carrots and peas to put this together. Then add the homemade crumble topping. BUT try it from scratch the first time first.. it really tastes so good! 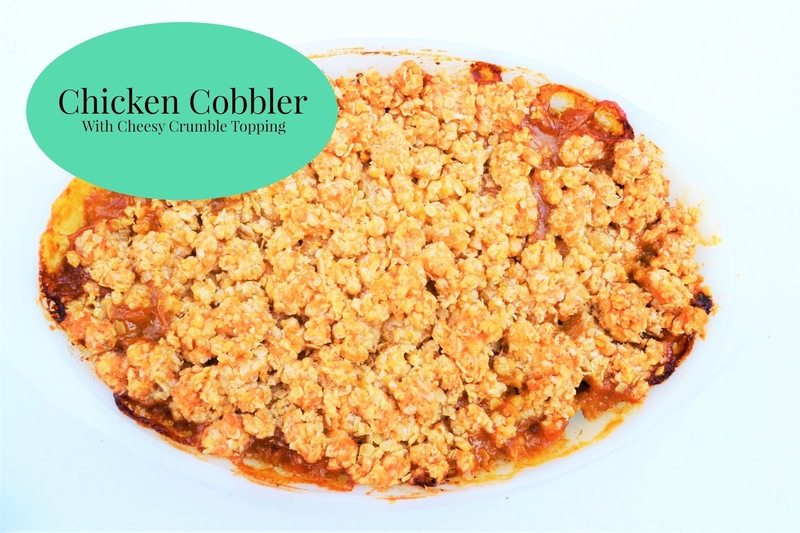 Crumble Topping: In a medium bowl, combine the butter with the flour, and oats. Work with a fork or pastry blender until the mixture is mealy. add the cheese, garlic and salt. Stir well until blended. Set aside. In a large skillet, saute the bacon over medium heat until fat is rendered. about 5 minutes. Add onion, bell pepper , carrots, and celery and continue cooking until lightly browned, about 8 minutes. Add mushrooms and continue cooking until they are browned about 6 minutes. Add chicken and cook, stirring for 5 minutes. Add the chicken stock and continue stirring until a thick sauce is made (about 2 minutes). Stir in chicken bouillon and peas, stirring to combine. Heat through 1 minute and remove from heat. Sprinkle crumble topping evenly over the filling and bake until golden brown, about 45 minutes. Do not sprinkle crumble topping on top of filling. Place crumble topping in a freezer safe seal-able bag, label and place on top of filling. Cover entire casserole with freezer safe lid or double layer of foil and label. Thaw 8 hours or overnight in fridge. Bake at 350° for 45 min. till golden brown. What a unique take on Chicken pot pie and I can't wait to try it. All the ingredients are just right for us! I could just nibble on the topping all day! I have a chicken stewing right now for chicken noodle soup. I am going to keep some of the meat aside for this delicious sounding dish. Thanks. ok, I want the soup, now! Yum! This sounds absolutely amazing! I am a big chicken pot pie fan, and simply have to try this version asap! Let me know how it turns out, when you try it!